Do you want to share the memories of your loved on with your entire family, friend circle, or anyone who visits your home? Our funeral photo books, or memorial tribute albums, will be cherished by children, grandkids, nieces and nephews for years to come. Each page is printed on high quality paper and bound with soft touch cover. These personalized memorial photo albums are 24 pages and measure 5×7 inches. Memorial photobooks provide everlasting memories for brothers, sisters, parents, and close friends. 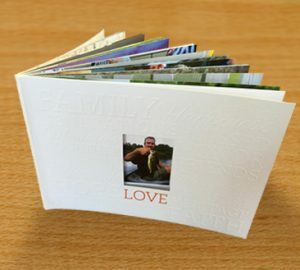 The cover of the tribute photo album has a cut-out to highlight your loved one’s picture on the first page. Memorial keepsakes ensure that the departed will not be forgotten. We want to help you commemorate your loved one’s life quickly and affordably at FuneralPrints.com. Do you need also need an order-of-service booklet to pass out at the memorial ceremony? Our funeral service programs are 8 pages with enough space to list the pastor, eulogists, readers, and family members. 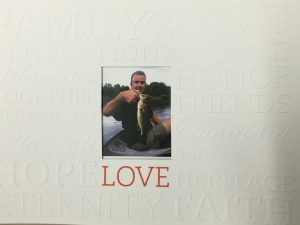 These memorial booklets are printed on 8.5×11 glossy paper and then folded in half allowing space for multiple photos and your loved one’s obituary. For shorter services, we offer funeral handouts, which are 4 page leaflets with a cover photo, two inner pages, and a back cover. Are you planning the funeral of your loved one? Your loved one was a special and unique person, we want to help you remember them with our creative memorial service ideas. Our design staff will create any of the prayer cards, funeral cards or laminated bookmarks absolutely free. Our mission is to provide you with professional funeral printing services quickly and affordably. All orders entered before 3pm EST are shipped out the same day. Call 1-800-774-4313.